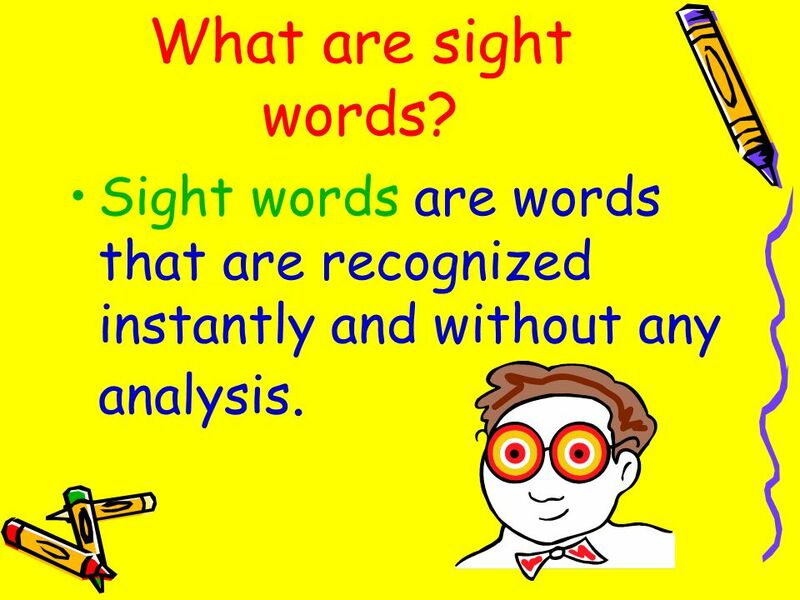 3 What are sight words? 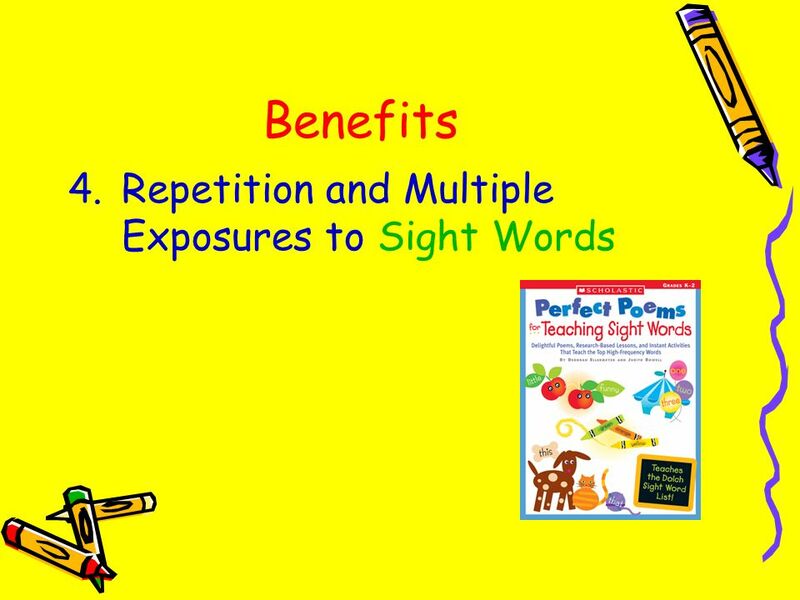 Sight words are words that are recognized instantly and without any analysis. 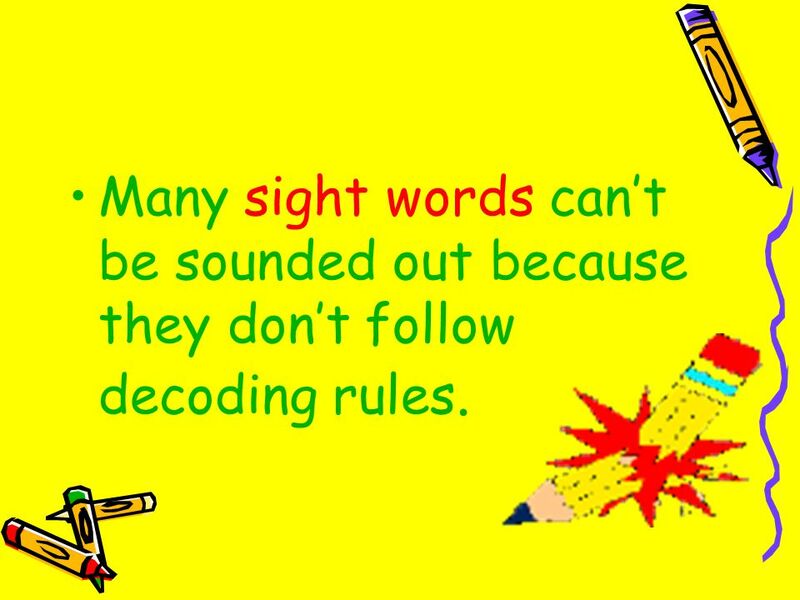 4 Many sight words can’t be sounded out because they don’t follow decoding rules. 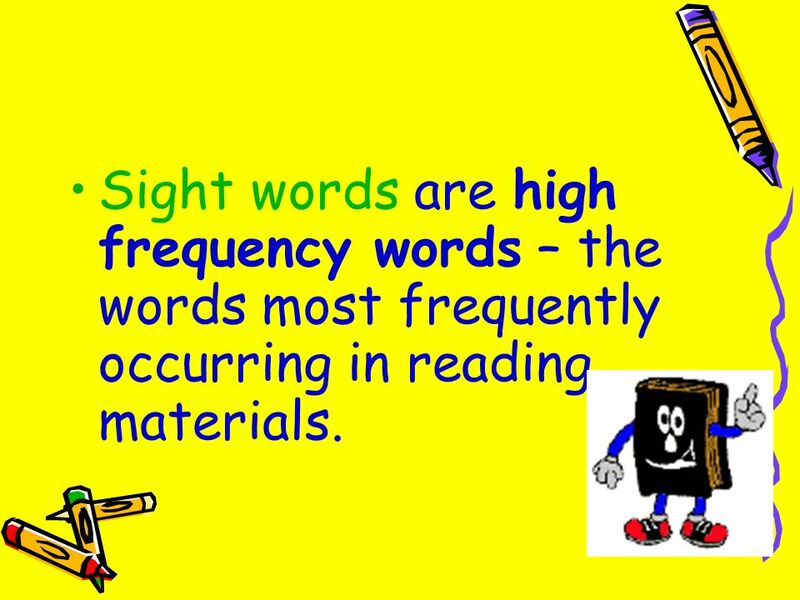 5 Sight words are high frequency words – the words most frequently occurring in reading materials. 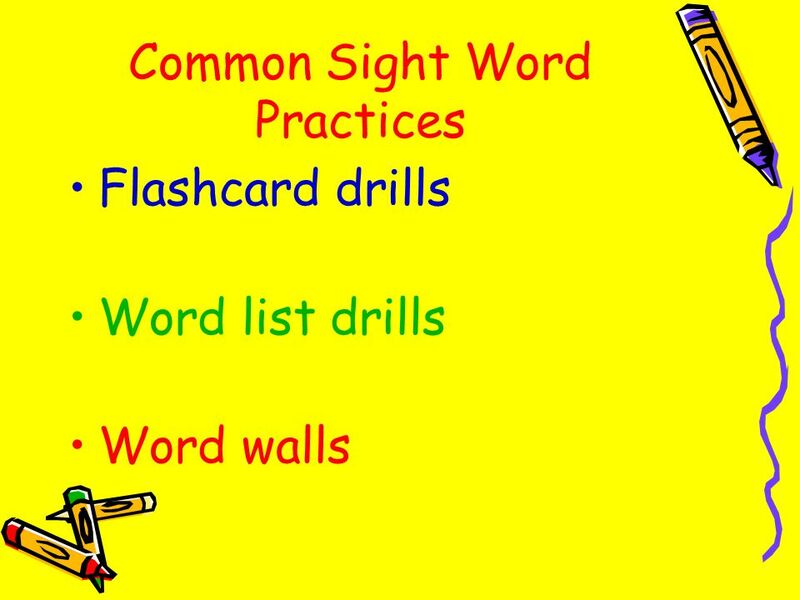 6 Why do we teach sight words? 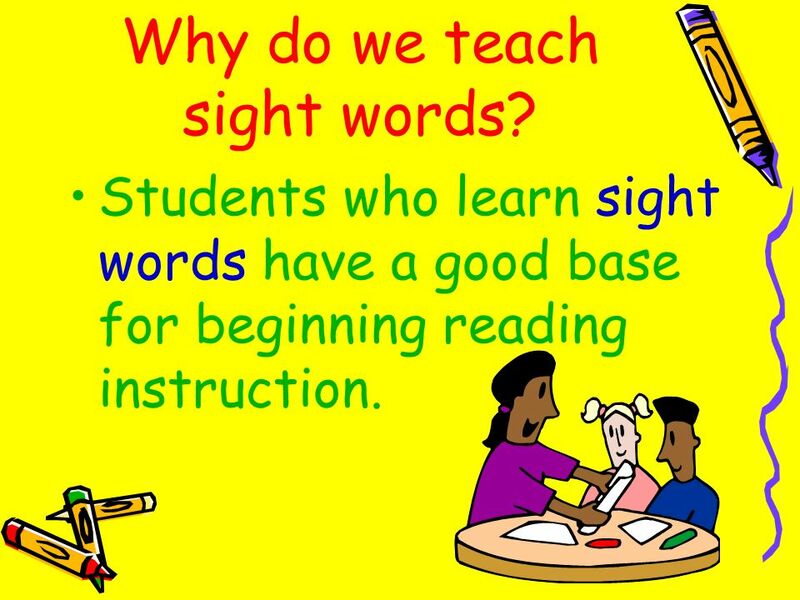 Students who learn sight words have a good base for beginning reading instruction. 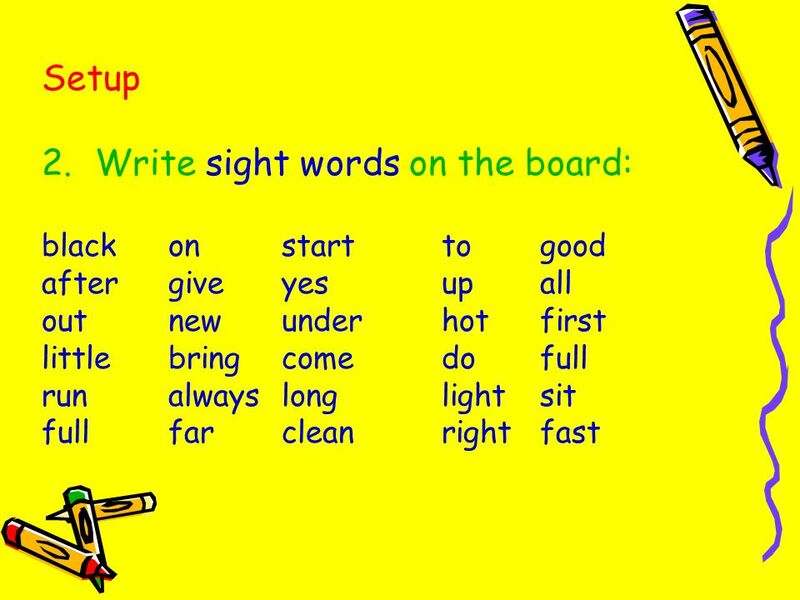 7 When do we teach sight words? 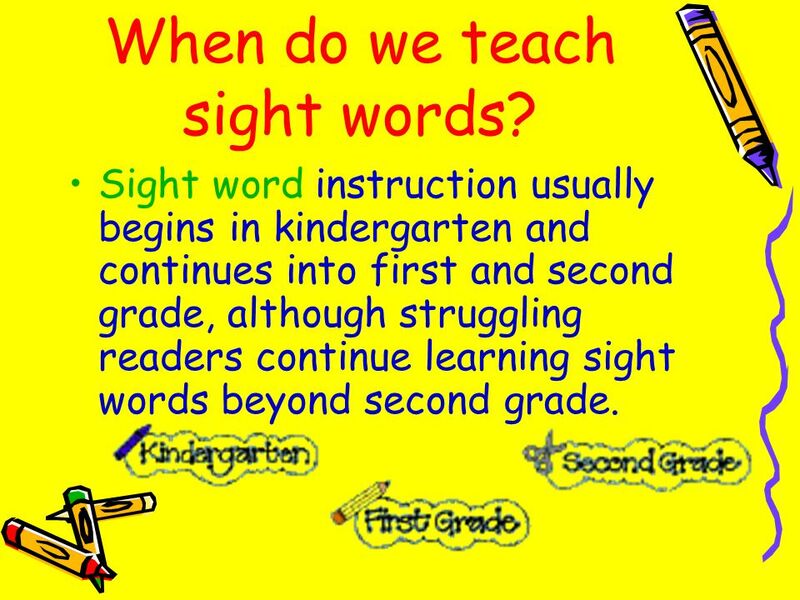 Sight word instruction usually begins in kindergarten and continues into first and second grade, although struggling readers continue learning sight words beyond second grade. 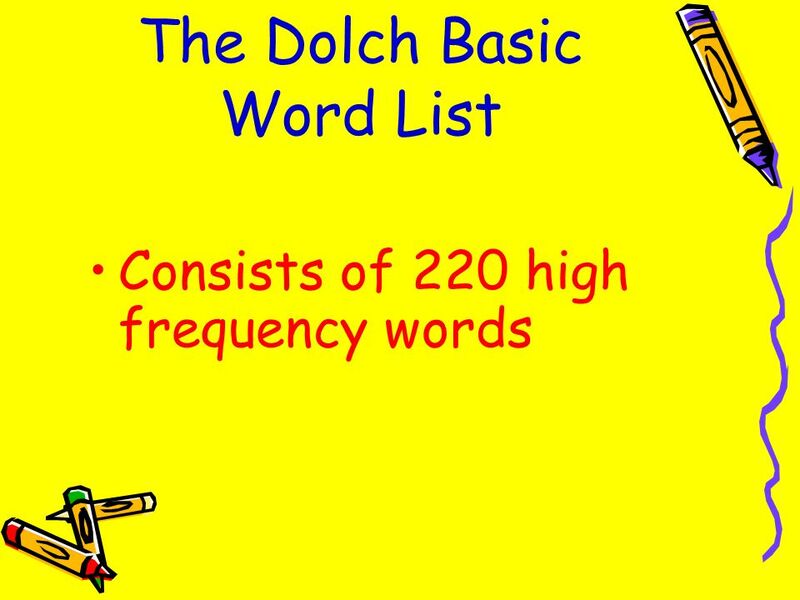 Consists of 220 high frequency words "a" "and" "away" "big" "blue" "can" "come" "down" "find"
14 How do I teach sight words? 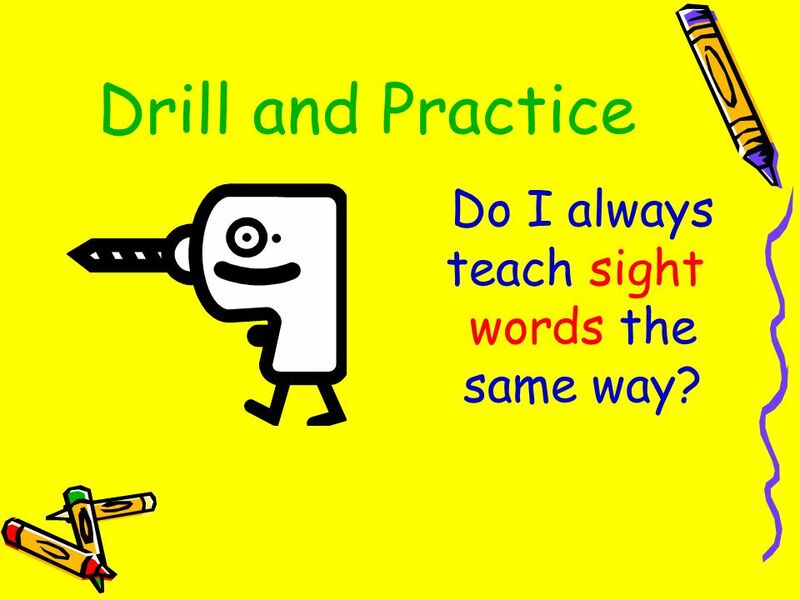 15 Drill and Practice Do I always teach sight words the same way? 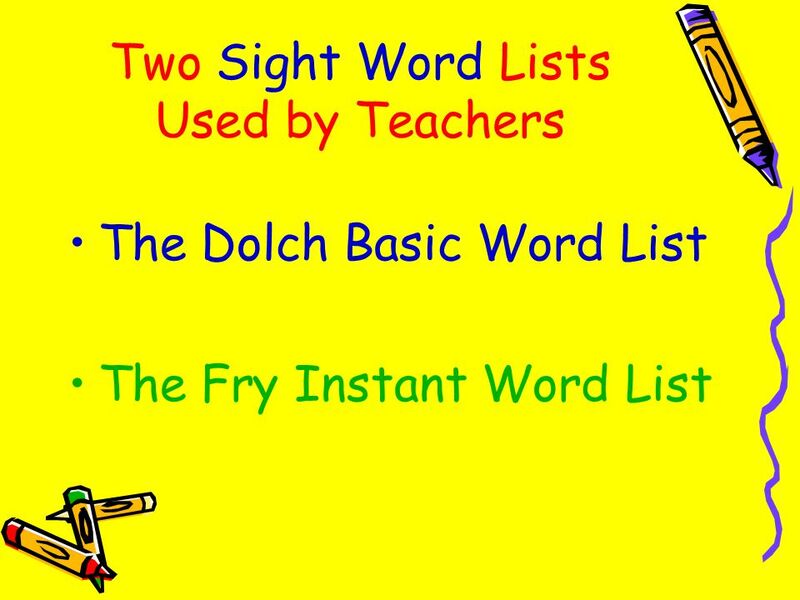 16 Do I enjoy teaching sight words? 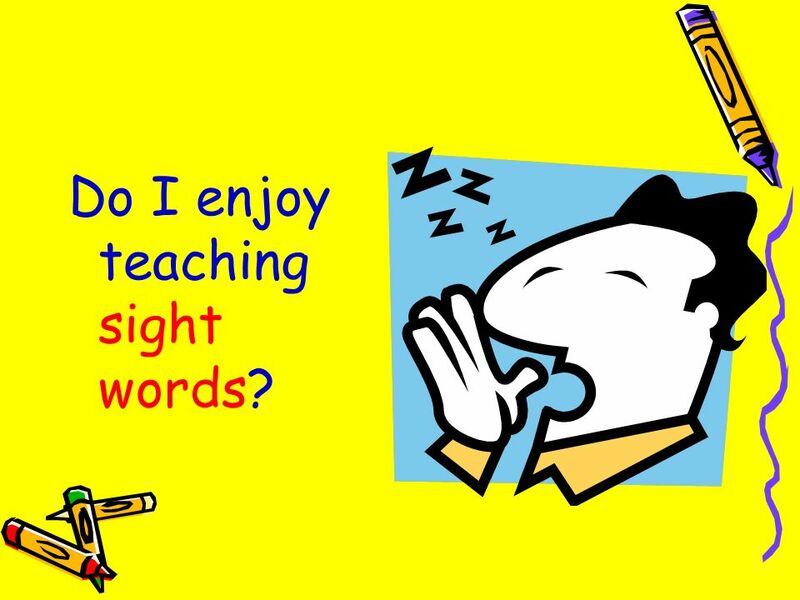 17 Do my students enjoy sight words routines? 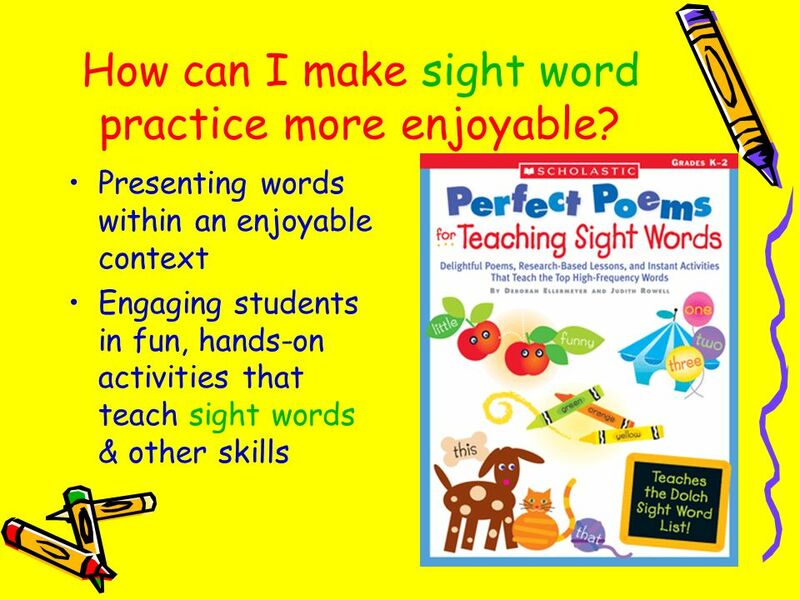 18 How can I make sight word practice more enjoyable? 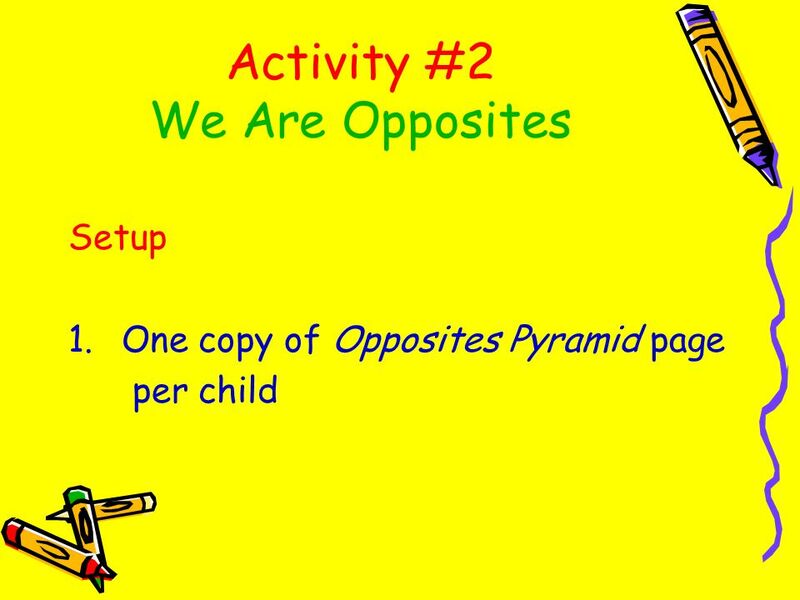 29 We Are Opposites We are opposites, And I’ll tell you more! 30 I think it’s hot, You think it’s cold. 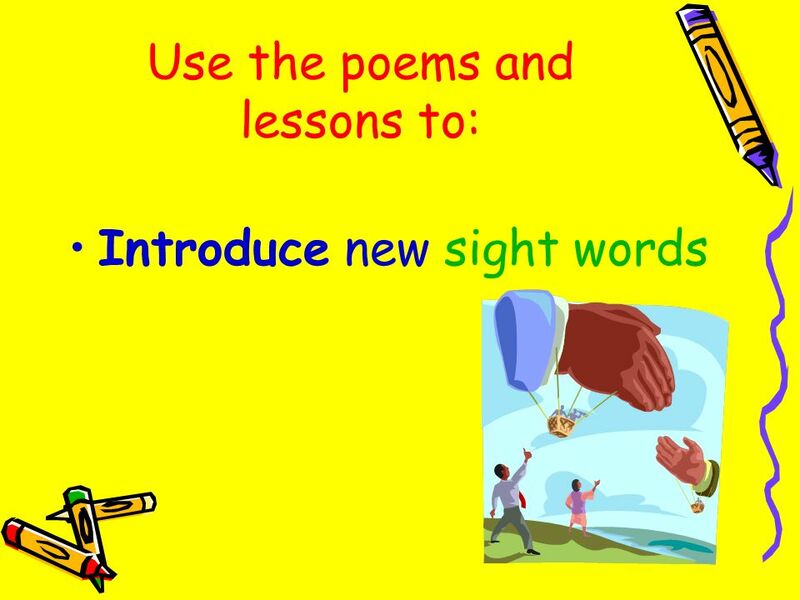 I say it’s new, You say it’s old. 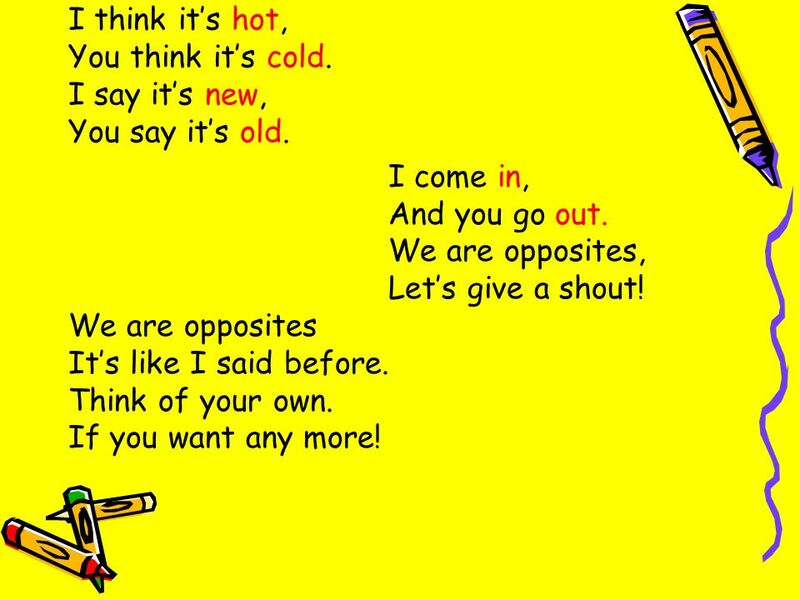 I come in, And you go out. 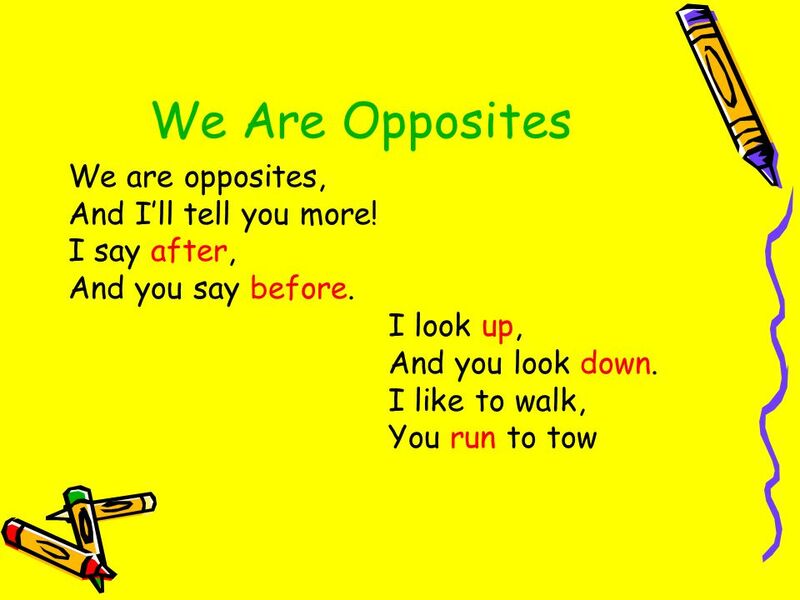 We are opposites, Let’s give a shout! 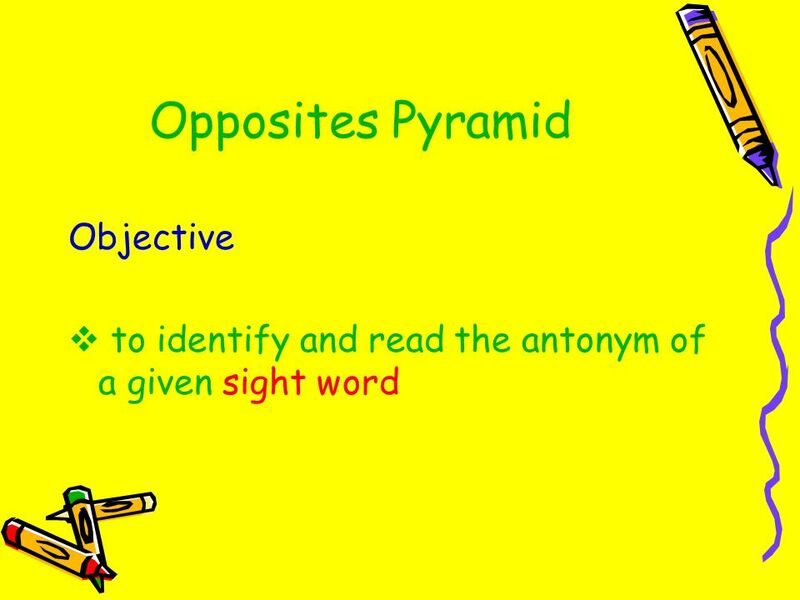 We are opposites It’s like I said before. 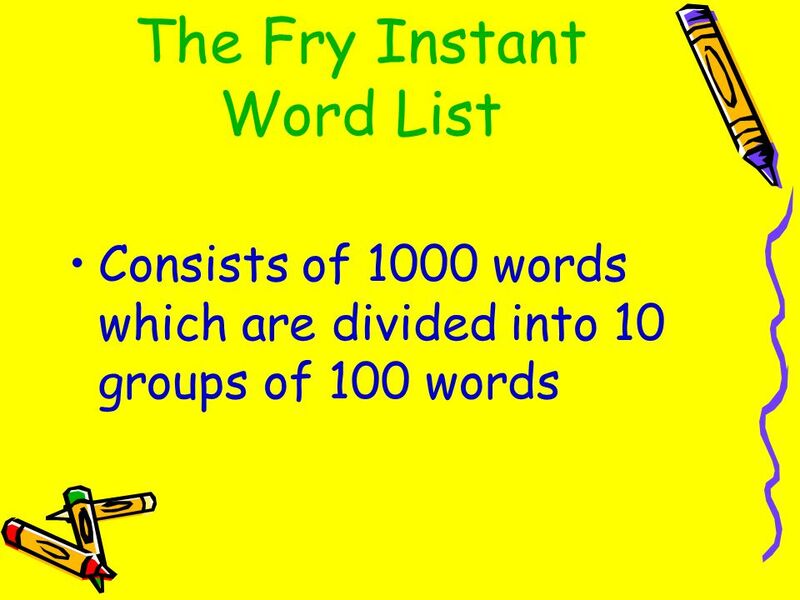 Think of your own. 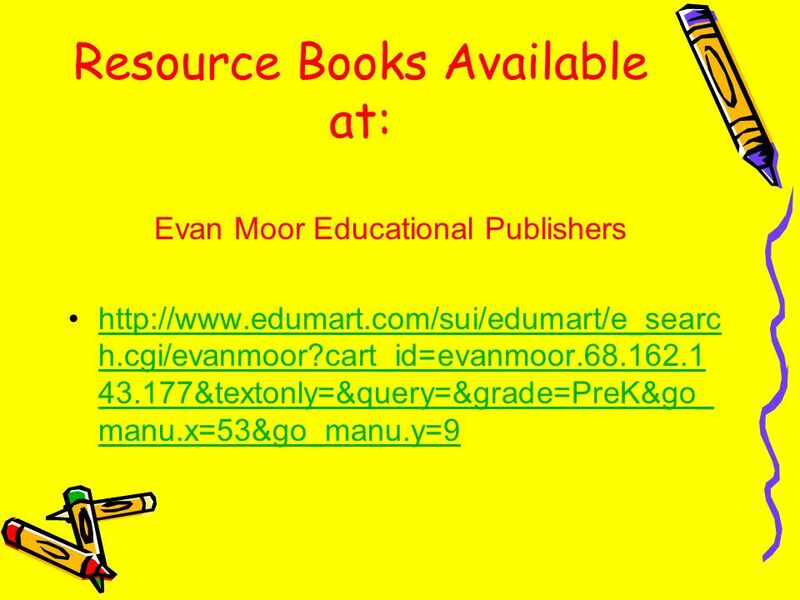 If you want any more! 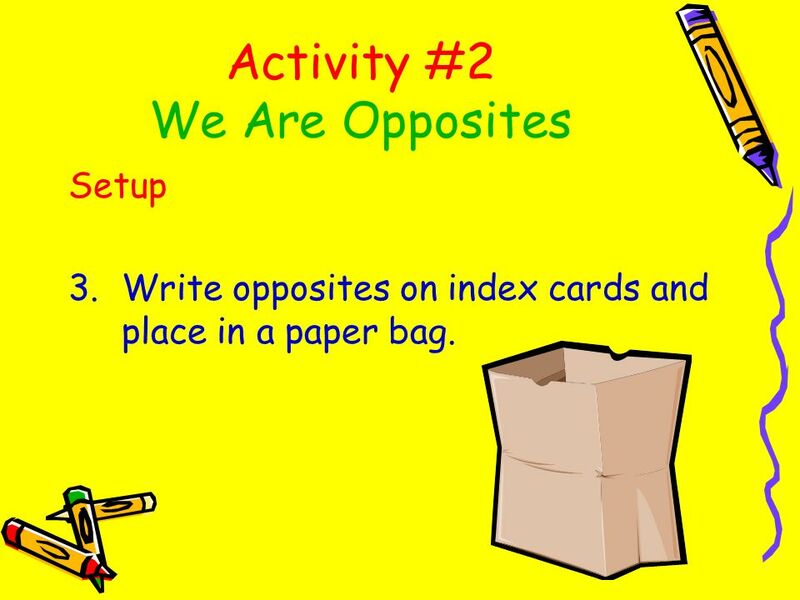 Setup Write opposites on index cards and place in a paper bag. 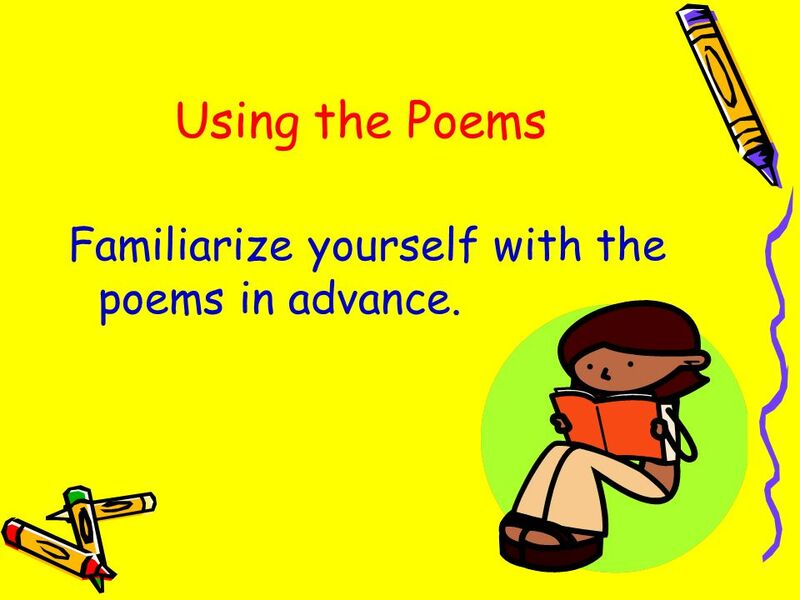 35 Using the Poems Familiarize yourself with the poems in advance. 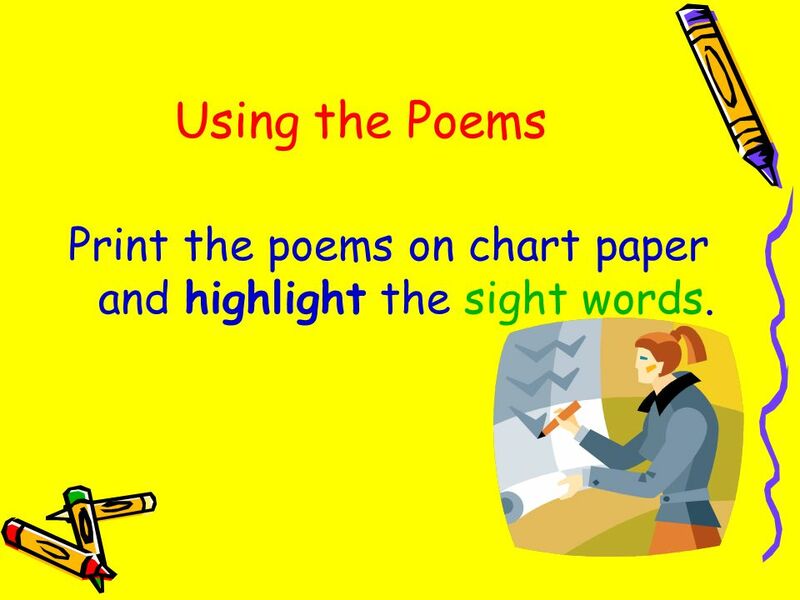 36 Using the Poems Print the poems on chart paper and highlight the sight words. 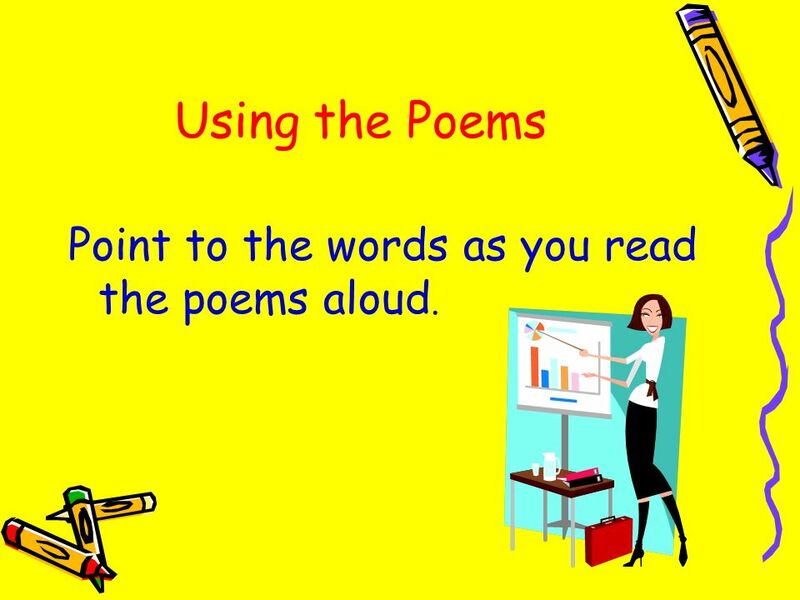 37 Using the Poems Point to the words as you read the poems aloud. 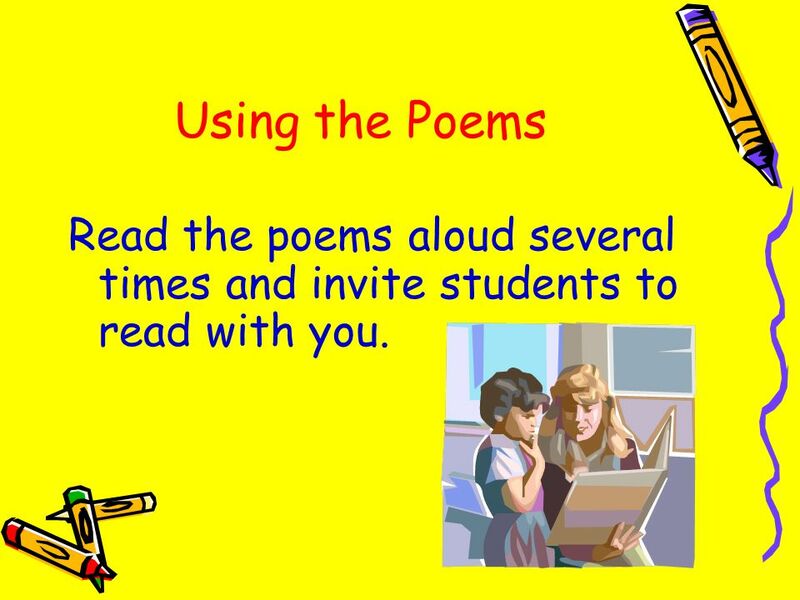 38 Using the Poems Read the poems aloud several times and invite students to read with you. 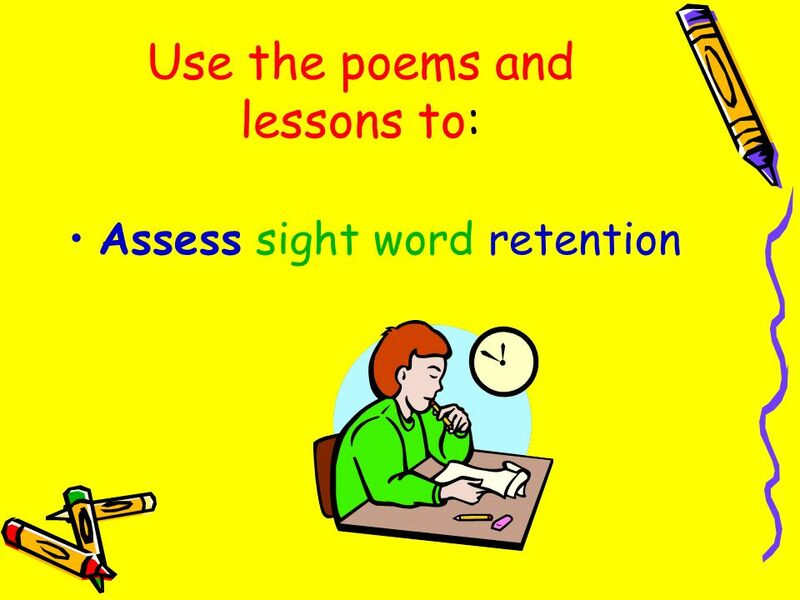 39 Using the Poems Print the sight words on flashcards for practice in isolation. 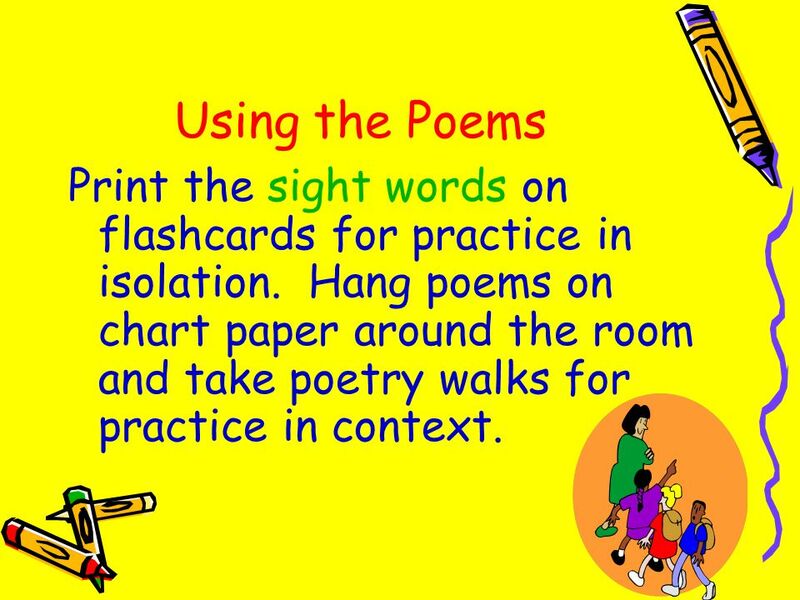 Hang poems on chart paper around the room and take poetry walks for practice in context. 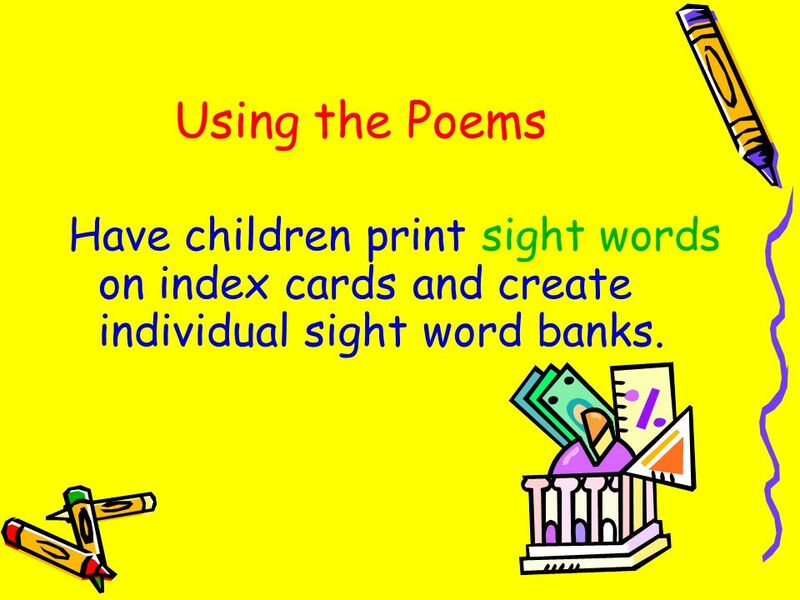 40 Using the Poems Have children print sight words on index cards and create individual sight word banks. 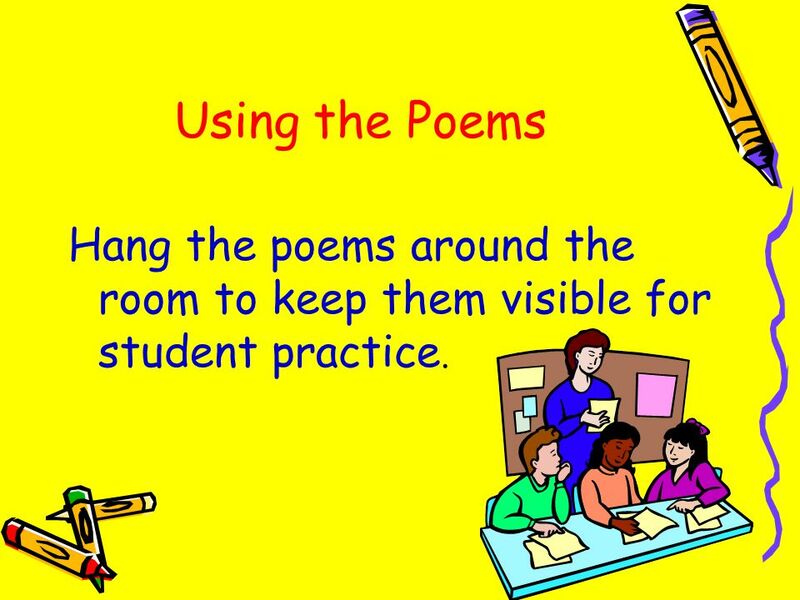 41 Using the Poems Hang the poems around the room to keep them visible for student practice. 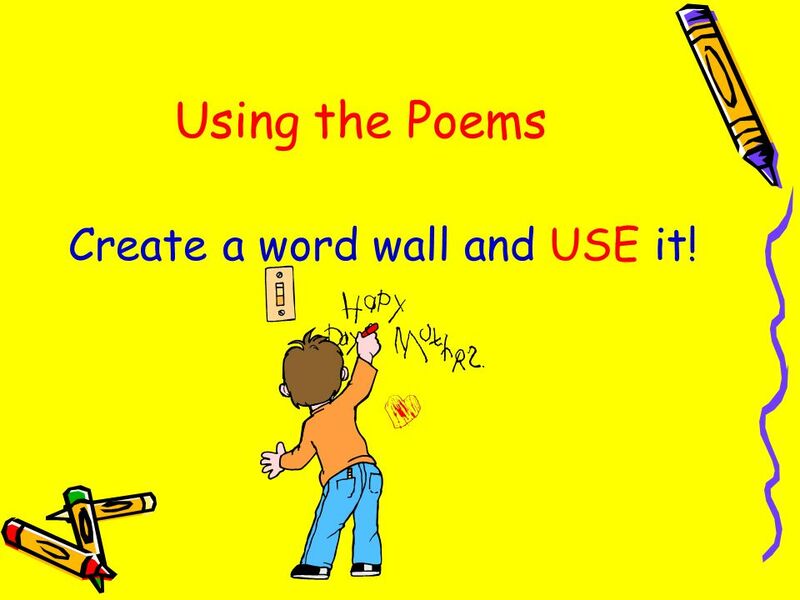 42 Using the Poems Create a word wall and USE it! 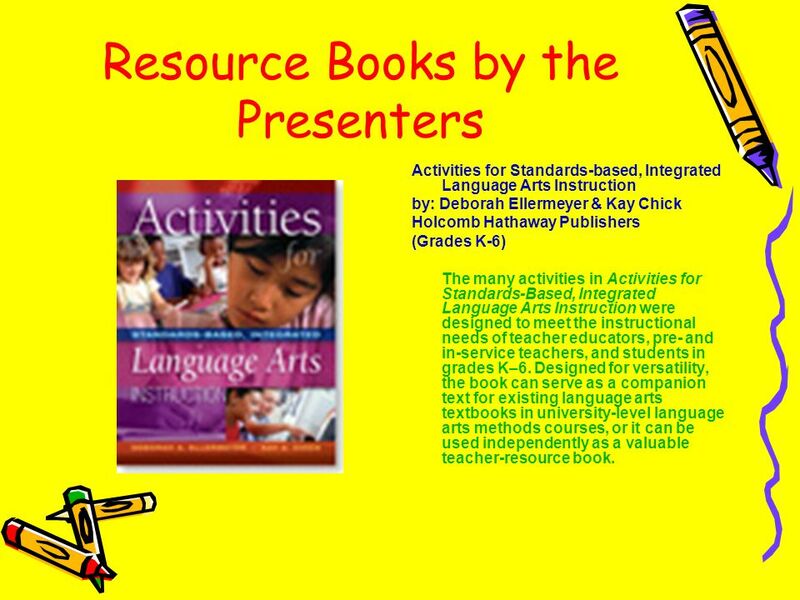 Activities for Standards-based, Integrated Language Arts Instruction by: Deborah Ellermeyer & Kay Chick Holcomb Hathaway Publishers (Grades K-6) The many activities in Activities for Standards-Based, Integrated Language Arts Instruction were designed to meet the instructional needs of teacher educators, pre- and in-service teachers, and students in grades K–6. 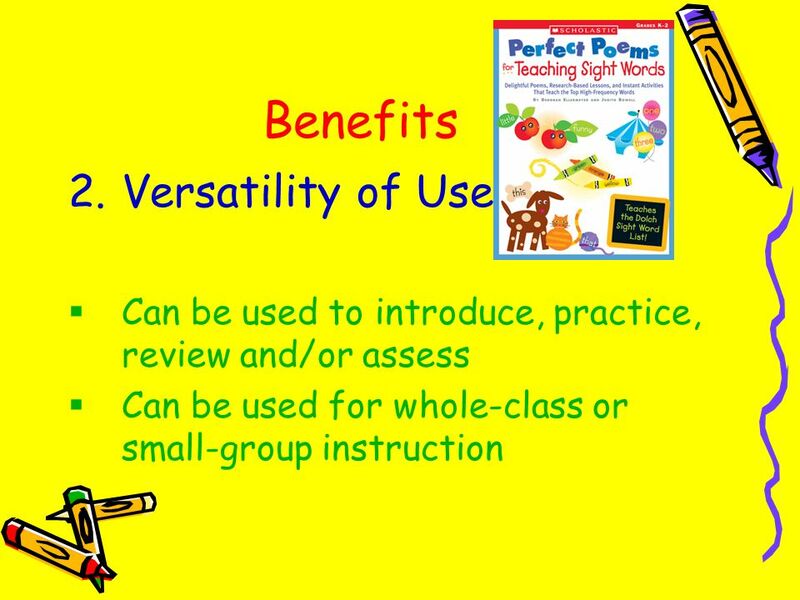 Designed for versatility, the book can serve as a companion text for existing language arts textbooks in university-level language arts methods courses, or it can be used independently as a valuable teacher-resource book. 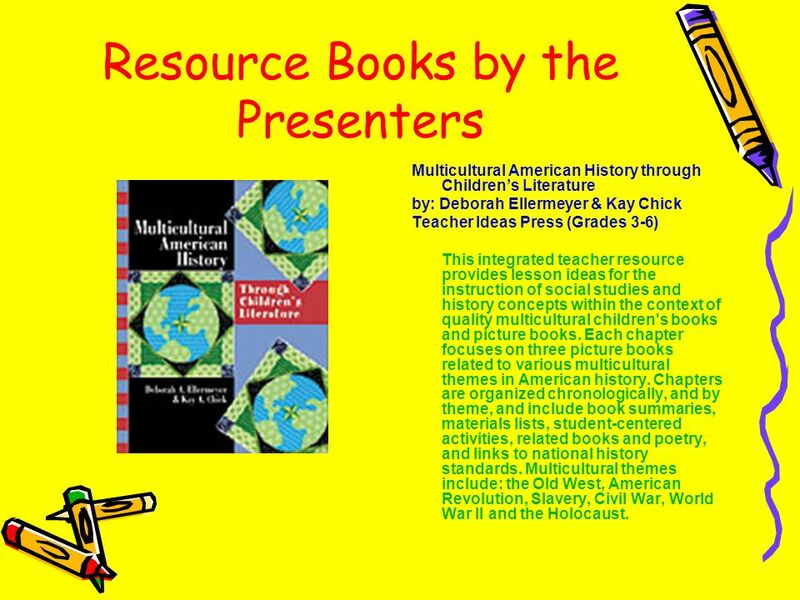 Multicultural American History through Children’s Literature by: Deborah Ellermeyer & Kay Chick Teacher Ideas Press (Grades 3-6) This integrated teacher resource provides lesson ideas for the instruction of social studies and history concepts within the context of quality multicultural children's books and picture books. 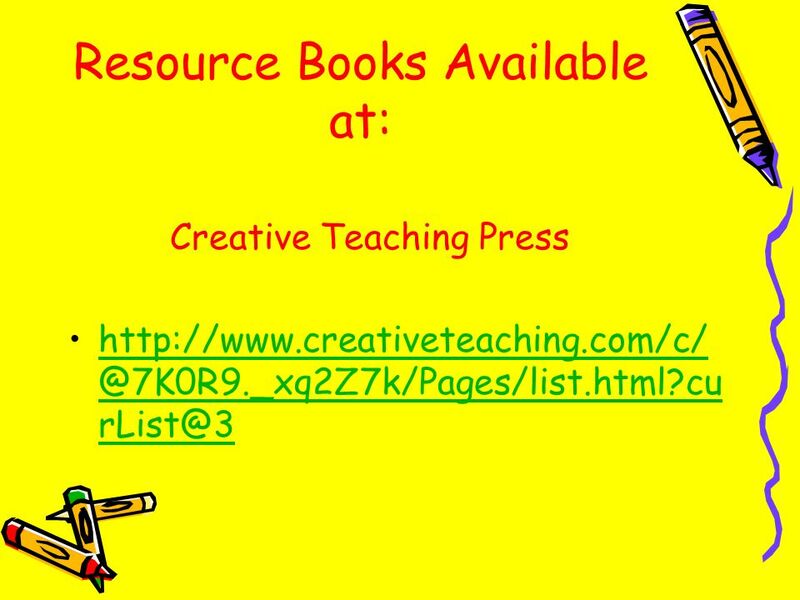 Each chapter focuses on three picture books related to various multicultural themes in American history. 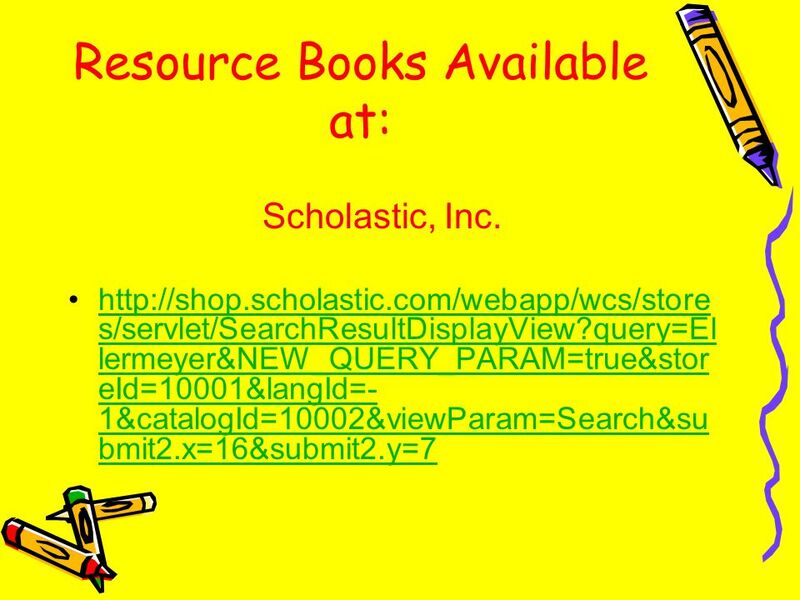 Chapters are organized chronologically, and by theme, and include book summaries, materials lists, student-centered activities, related books and poetry, and links to national history standards. 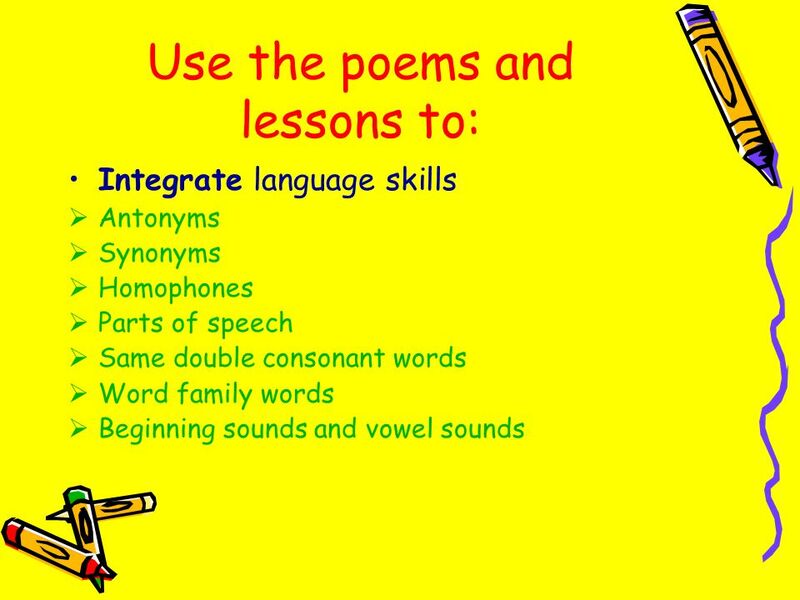 Multicultural themes include: the Old West, American Revolution, Slavery, Civil War, World War II and the Holocaust. 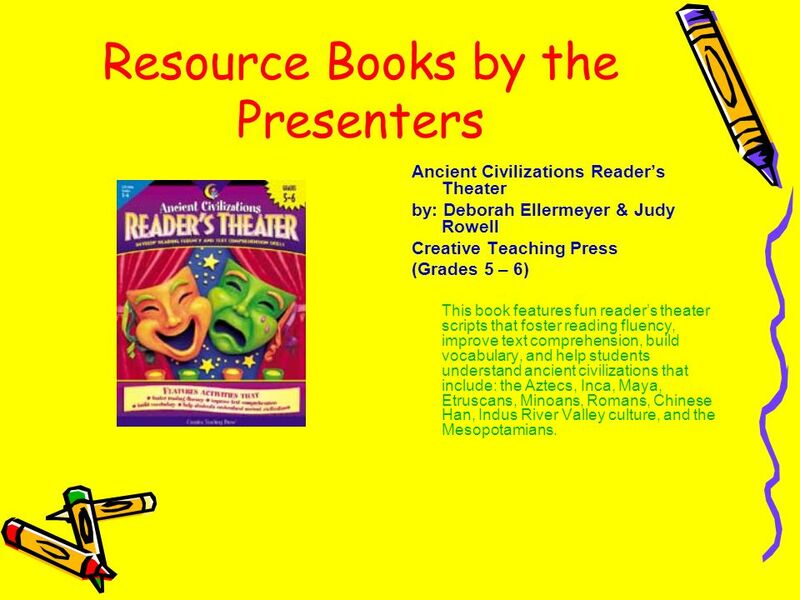 Ancient Civilizations Reader’s Theater by: Deborah Ellermeyer & Judy Rowell Creative Teaching Press (Grades 5 – 6) This book features fun reader’s theater scripts that foster reading fluency, improve text comprehension, build vocabulary, and help students understand ancient civilizations that include: the Aztecs, Inca, Maya, Etruscans, Minoans, Romans, Chinese Han, Indus River Valley culture, and the Mesopotamians. 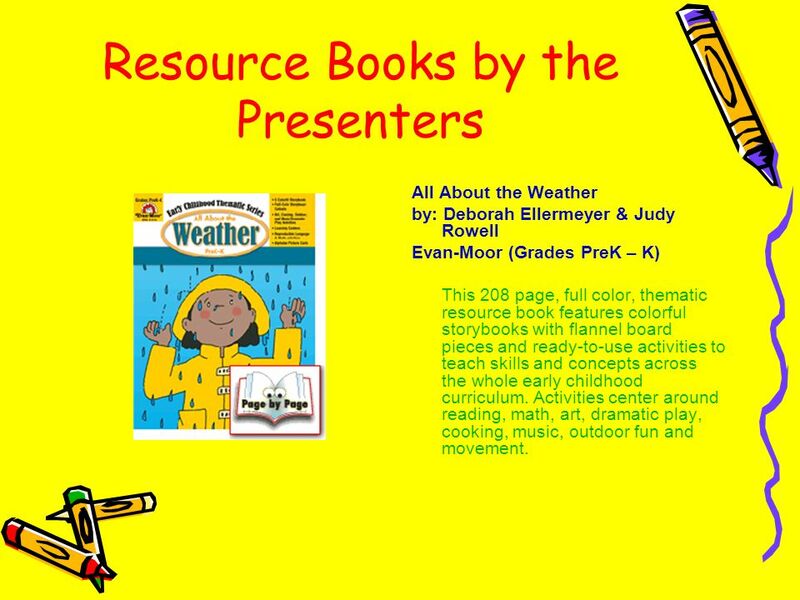 All About the Weather by: Deborah Ellermeyer & Judy Rowell Evan-Moor (Grades PreK – K) This 208 page, full color, thematic resource book features colorful storybooks with flannel board pieces and ready-to-use activities to teach skills and concepts across the whole early childhood curriculum. 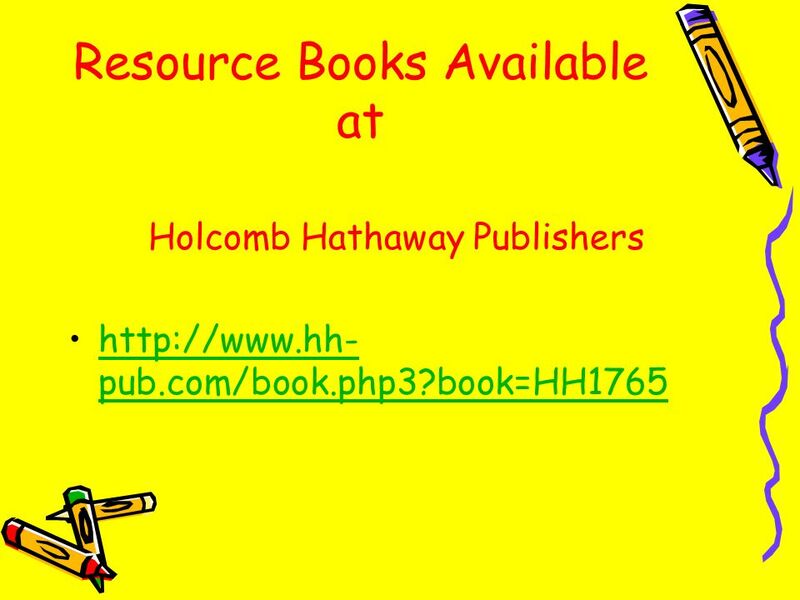 Activities center around reading, math, art, dramatic play, cooking, music, outdoor fun and movement. 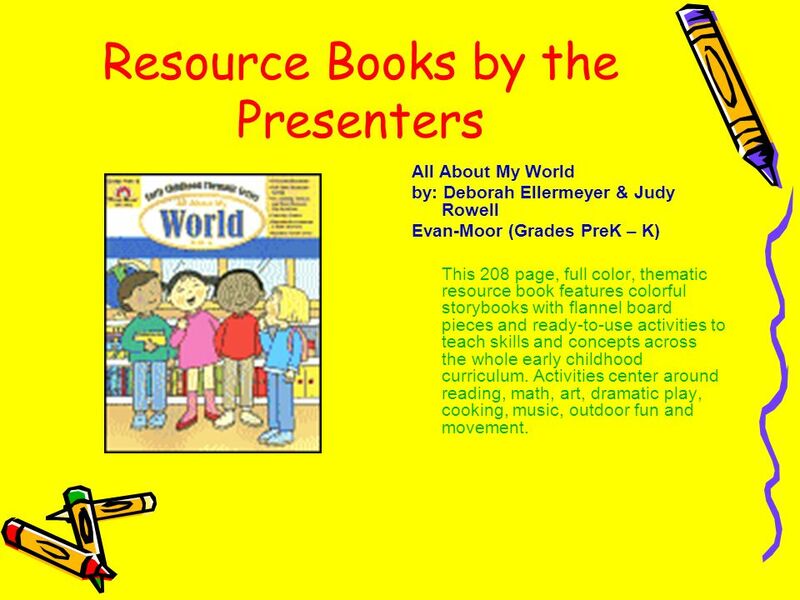 All About My World by: Deborah Ellermeyer & Judy Rowell Evan-Moor (Grades PreK – K) This 208 page, full color, thematic resource book features colorful storybooks with flannel board pieces and ready-to-use activities to teach skills and concepts across the whole early childhood curriculum. 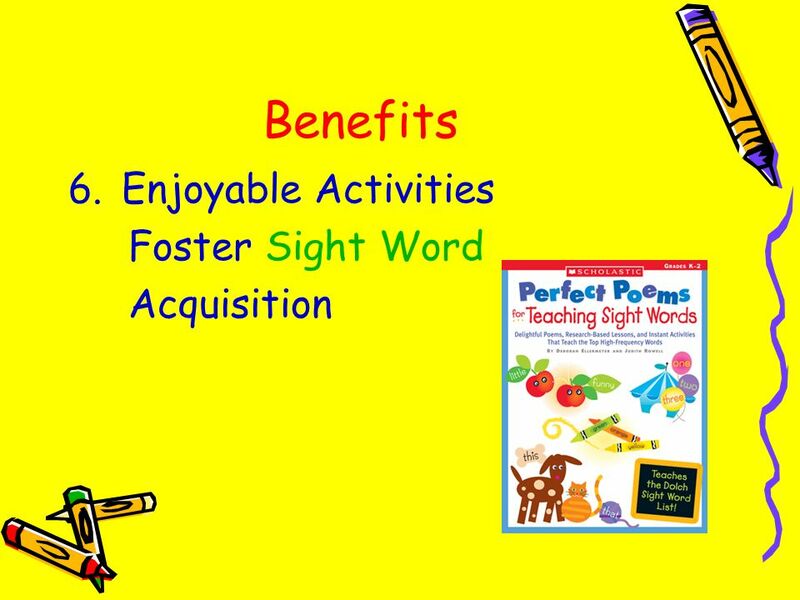 Activities center around reading, math, art, dramatic play, cooking, music, outdoor fun and movement. 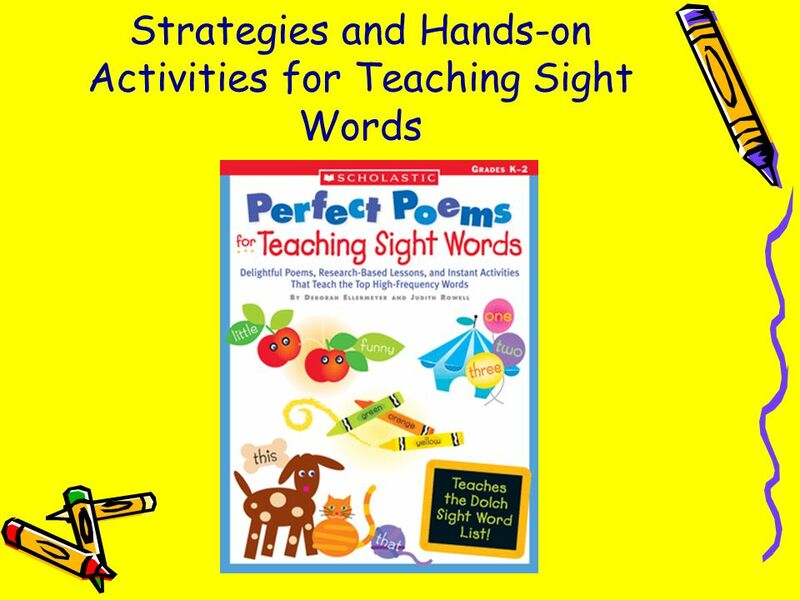 Download ppt "Strategies and Hands-on Activities for Teaching Sight Words"
CTC Reading Curriculum Overview July 26, CCS EOG Reading Goal Summary Data Grade 3 Goal % (weighted mean % correct) Goal % (weighted. CURRICULAR MAPPING: ALIGNING ALL INTEGRATED COMPONENTS TO NJCCCS Fred Carrigg Special Assistant to the Commissioner for Urban Literacy. 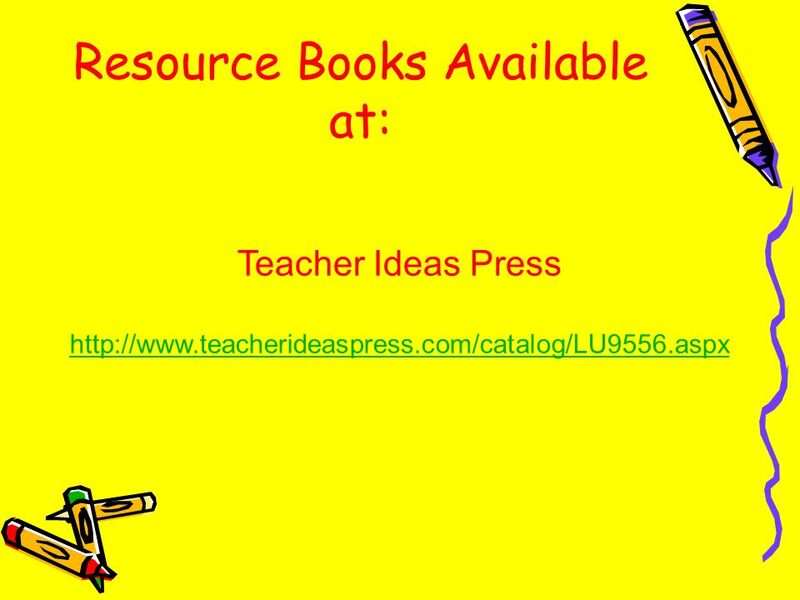 Working with you, were changing the world one learner at a time. 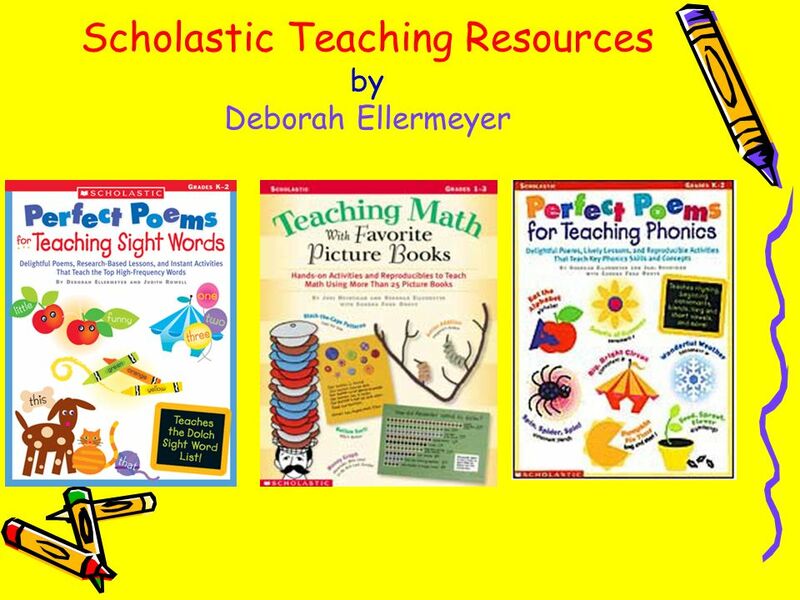 Gwinnett County Public Schools SuccessMaker ® At-Home. 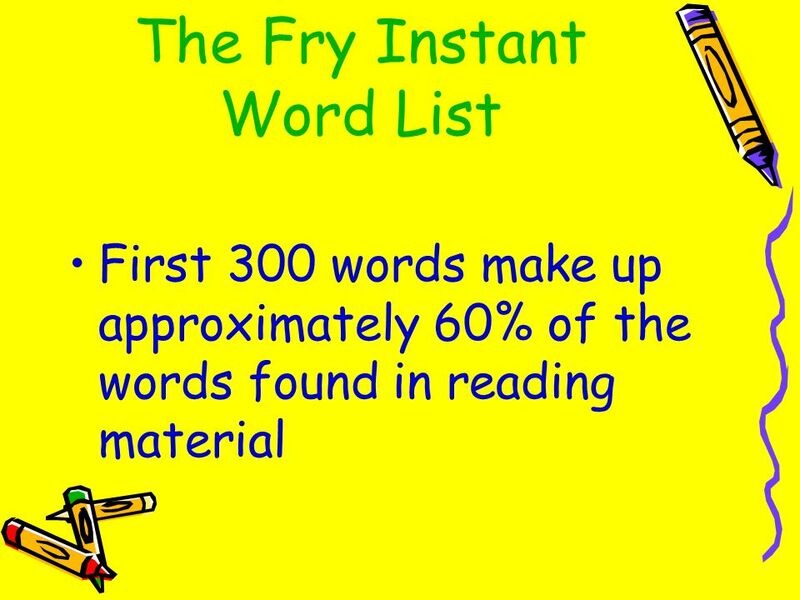 What does it look like: …at the table? 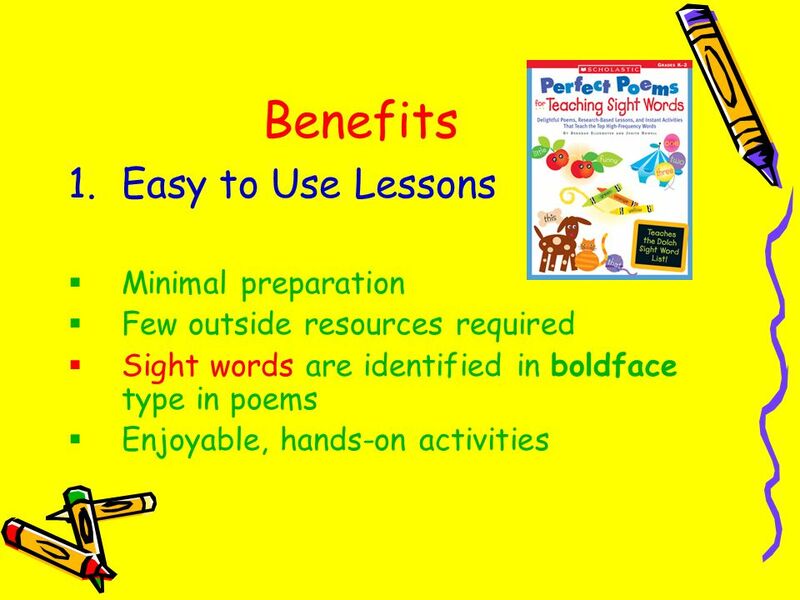 Guided Reading What does it look like: …at the table? Mia Johnson, Lora Drum. 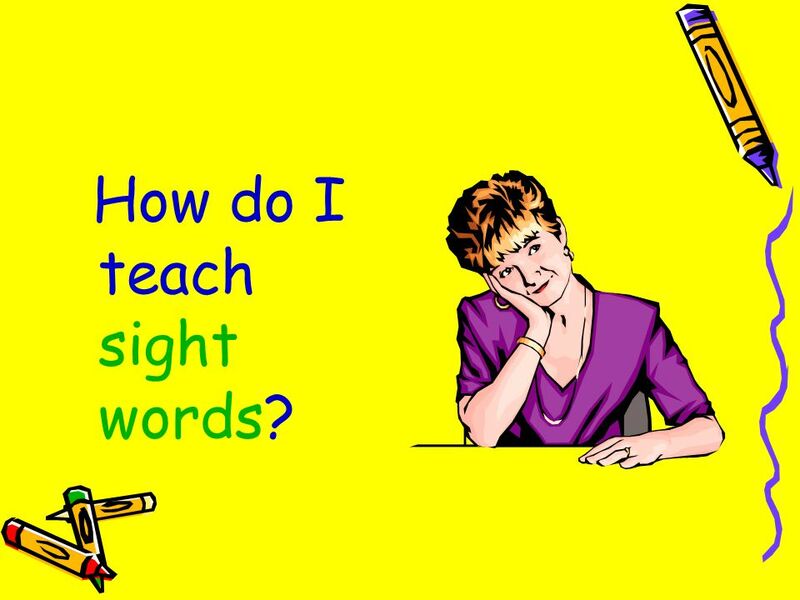 Working with you, we’re changing the world one learner at a time. 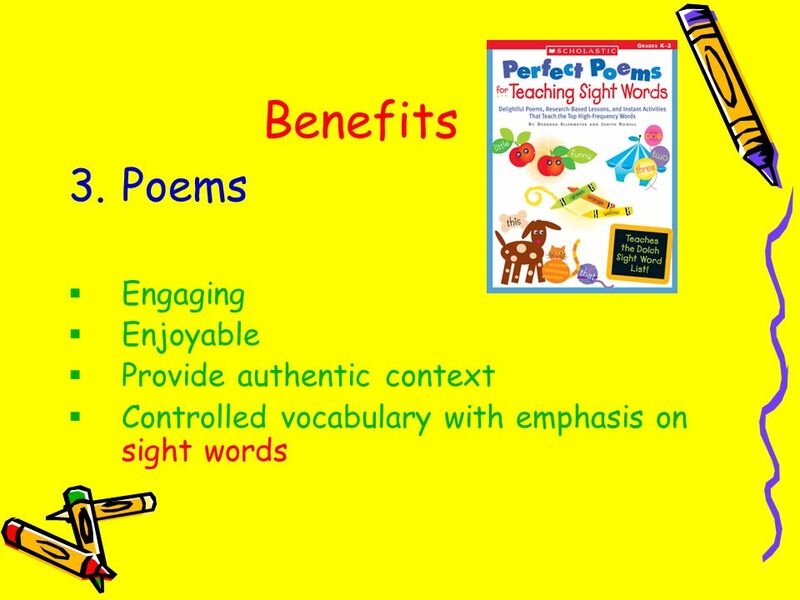 Gwinnett County Public Schools SuccessMaker ® At-Home. 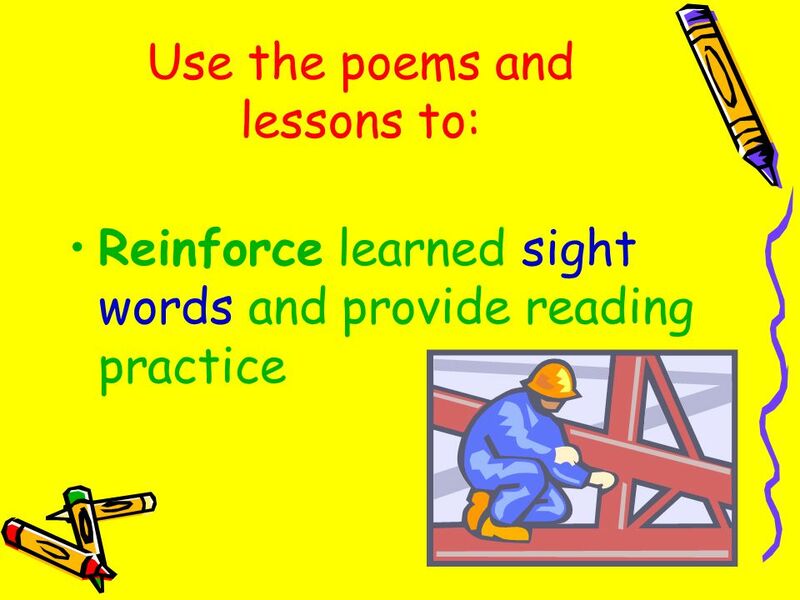 How can we help children become confident readers? 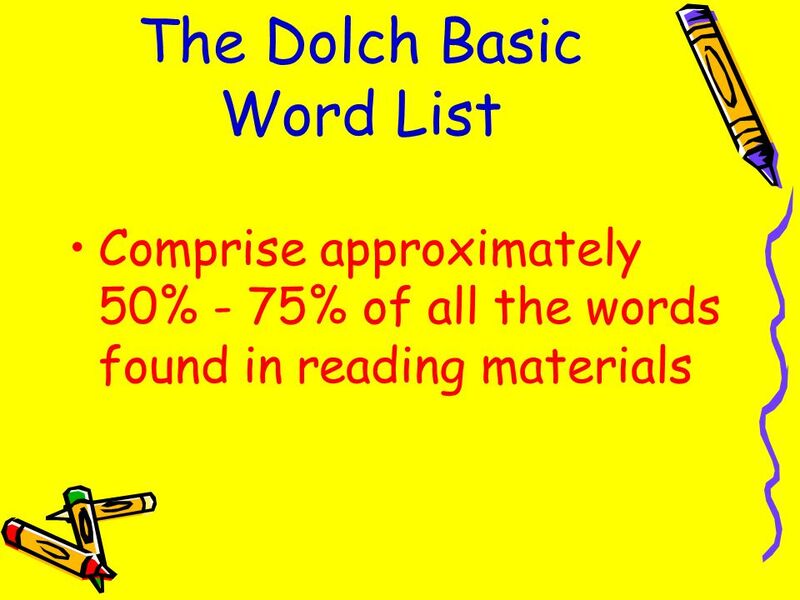 The Function and Use of a Print Rich Environment in the Dual Language/Bilingual Classroom. 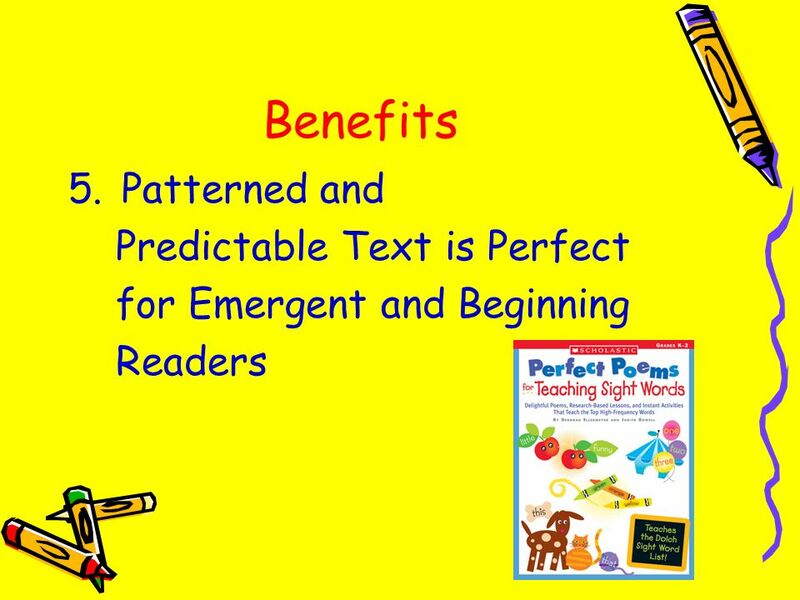 COMPREHENSION FOR EMERGENT READERS YOUNGER CHILDREN NEED “ACTIVE AND VISIBLE” INSTRUCTION AUTHOR WANDA L. CARTER. Welcome to our 3 rd Grade Back to School Night Thanks for coming!